More4you Blogletter » The Web or the Galaxy? « Spread A Virus, Make Some Money! If you are like me, you like to search Flickr for pics for either entertainment, or to go with a blog you are writing. Being a visual person, I love to see pics from all over the world, getting the different perspectives and views. I was reading up on my regular reading of Mashable and saw an interesting article on Tag Galaxy, an amazing banquet for your eyes. You choose a tag, which can be anything, a city, a park, the ocean, famous beaches, etc. Once you choose your tag, there will be a black background ,with some colorful planets appearing in the galaxy, revolving around a main planet which is your chosen tag. 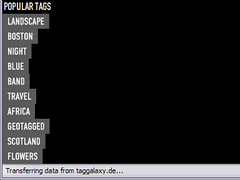 The surrounding planets will be the different categories of your tag. For example, if you choose New York, you will have surrounding planets representing “night”, “Manhattan”, “NewYorkCity”, “Brooklyn”, “USA”, then you choose which planet of pics you want to view. If you choose “Manhattan”, then the planet will become a large globe being covered with photos all about Manhattan. You then click on any pic on the globe and it will be enlarged for your viewing, then choose another, then another. It is really quite fascinating and a really cool way to surf photos on the web. In the mood for some incredible sunsets, or white sandy shores, then choose “Beaches” and you will have an unlimited view of beaches all over the world. You can rotate the image of pictures choosing anything that catches your attention. Expand the pic, once you are done, click on the X in the right corner and you are back to your visual globe. Yes, you may be wondering, why not just search Flickr instead… and you can, but this is just a way to do it in a more entertaining way… a feast for your eyes. You may find it a bit addictive, time slipping away while you browse, so plan on doing this when you have some time to kill. So, how does this relate to Viral Marketing? If you are an owner of these pictures, your name is shown along with where to view more of your photos. You can link your website, your signature, contact information with your Flickr page to these photos. This is just another way to get your name, your photos, your label and brand out amongst the public eye.